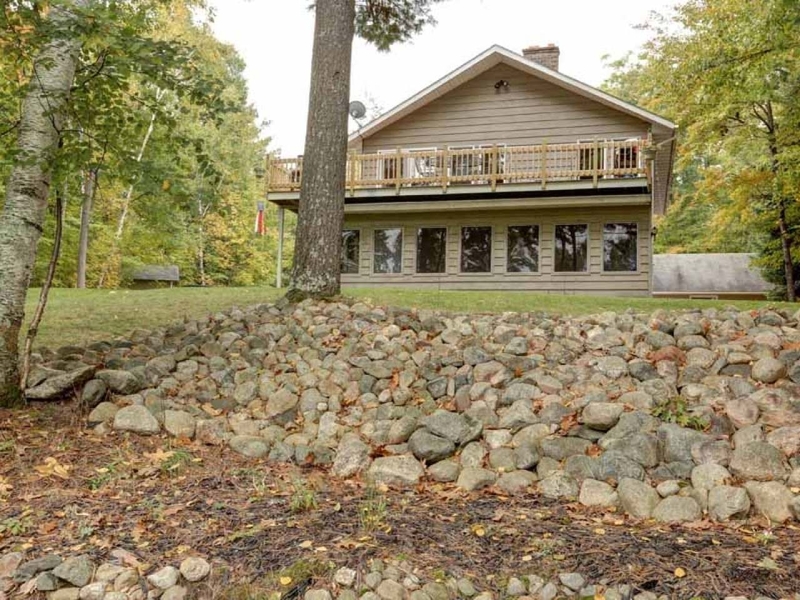 Seclusion and solid sand frontage are what you will find at this 3+ bedroom, 2BA home on crystal clear Squash Lake. The home&apos;s main level features a galley kitchen, adjoining dining area w/ deck access, laundry, a full BA, 2/BD, and the lake-facing living room w/ tongue & groove vaulted & beamed ceiling and an impressive fieldstone backdrop for a wood or pellet stove. The LL provides a second full BA, third BD, sauna, bonus room, and a family room w/ brick woodstove backdrop & direct entry to the 10&apos;x28&apos; lakeside 3-season room. The exterior enjoys an expansive deck for relaxing & BBQ-ing while overlooking the water, 3-car detached garage, additional parking space, and a landscaped shoreline w/ an expansive sand beach. Set on wooded a 2.43 acre lot with bay frontage, the property remains private with little boat traffic yet offers immediate access to Squash Lake&apos;s 398 acres of boating, kayaking, fishing and all that a fully recreational lake offers.